Tips for ensuring proper calcium absorption in growing horses. Everyone wants strong, healthy foals and for them to grow to their full potential. 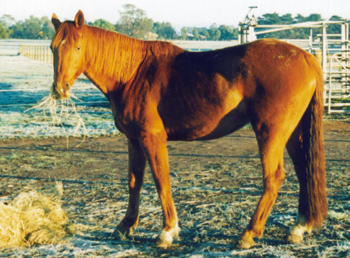 This depends on correct feeding of the mare from conception with particular attention paid to the last trimester of pregnancy when the foetus is in rapid growth mode. Have a think about the nutritional demands of the mare while she is lactating, as during this time she is feeding herself plus the growing foal. If there is insufficient calcium in her diet, it will be borrowed from the calcium reserves in her own bones. This can easily result in the mare suffering from calcium depletion and not being able to supply enough to build a strong skeleton in the new foal. When is a good time to start supplementing the foal? From about three months of age when growth has reached the point that the foal does not get its full requirements from its mother's milk. Of course, young horses go through the uglies, sometimes being rump high, then catching up in front, especially between about a year and a half to two and a half years of age. That's when they change from their initial morphology, which is similar to that of a goat or antelope - very flat bodied, very short-backed, upright neck, with very little body mass, to their adult morphology, which is much longer bodied, noticeably broader through the chest and rump, and much more developed overall. You often hear it mentioned that some breeds are 'early maturing'. Did you know that skeletally all horses mature at exactly the same rate? At each end of every bone in their body there is an active 'growth plate' where new bone is being formed until the horse is seven or eight years old. The first to finish this process are the knee joints and the last are the bones of the vertebral column. If you ever get the chance to attend any of Dr Deb Bennett's seminars or clinics then don't miss it. She clears up all these points and you realise what good practice it is to leave horses until they are at least four years old before starting them. Clearly it is imperative to provide essential nutrients which are the building blocks for these growing bones and other organs and tissues. They need to be present since conception in order to avoid problems later on. As growth rates increase, so does the need for the nutrients essential for substantial bone development. There is plenty of readily available information on how to feed broodmares and young horses. However, there is a distinct lack of information on various aspects of pasture that can interfere with normal growth of the foetus and the young horse. Long term it is advisable to soil test to ascertain whether vital minerals for normal growth, such as calcium, phosphorous, copper and selenium, are deficient. Contact Lucy Prior at Gotcha Equine for a full soil report based on what horses need. Australia wide the soils are generally considerably under the levels required, so supplementing the mare and growing horse is essential. Deficiency can reduce size, weakening of the skeleton causing it to be fragile and prone to breakdown and fractures. We now have extensive evidence that long term mineral imbalances will affect the horse's behaviour and scope of movement. For example, one of the first signs that a horse is chronically deficient in calcium and possibly heading towards developing Big Head is they will appear stiff and not track through behind. If your pasture contains any oxalate grasses (kikuyu, setaria, pangola, green panic) then this will need to be taken into account when supplementing. A product such as Oxalate/High Demand Vit & Min contains both organic plus inorganic forms of calcium. The inorganic portion will help act as a sacrifice and help mop up the oxalates, while the organic, being already bound can't be stolen by oxalates and is therefore bio-available to the horse. Your supplement should also contain calcium absorption co-factors (helpers). Magnesium is what stimulates the calcitonin hormone to deposit the calcium in the bones, boron is necessary to help retain both calcium and magnesium in the body, vitamin D is essential for helping calcium to pass through the gut wall into the bloodstream. Copper and vitamin A are also essential and lysine which will come from a quality protein source like soya bean meal. As horses requirements for calcium and the absorbing co-factors vary, it is useful to have them in separate products so you have control over the amounts they receive. A mare in foal not grazing oxalates will not have the same very high calcium requirement as one that is grazing oxalate grass but they will still require the same level of copper and vitamin A for example. Too much of some minerals, such as selenium, can be harmful so you need to be able to have them separate from the calcium supplement so it can be fed at high dose rates when required. It is a wise idea to save a paddock that has been ungrazed all winter for early spring grazing in order to avoid the mares consuming early spring growth. Spring growth can be too high in protein or non-protein nitrogen which becomes bound up as ammonia and urea molecules. The ammonia and urea are eventually excreted in the urine, which leads to increased water intake, increased urination and noticeable brown patches in the pasture where the urine has burnt the grass. A good quality protein source is a food that provides a sufficient amount of essential amino acids, particularly lysine and methionine. If insufficient quantities of lysine are present, then the horse's body will have difficulty using any of the other amino acids available. Lysine is important for calcium absorption in the growing horse. Have your young horses graze as mature grass as possible. Mature grass is minerally balanced and is high in fibre rather than carbohydrates, crude protein and nitrates like young grass. Efforts to ensure plenty of grass for the mare and foal often mean 'high octane' fertilisers are applied with no understanding of the harm these can cause to the breeding stock grazing them. Vegetative grass, especially so-called improved pastures, fertilised with these nitrogenous or phosphorous compounds can literally turn lethal under the 'right' weather conditions and of course spring weather is notoriously unpredictable. They cause an overload to the horse's system of potassium-nitrates which then have to be excreted, rapidly depleting calcium and magnesium levels. High potassium and nitrates also affect the bacterial populations in the hind-gut, causing over-growth of undesirable flora. This will cause metabolic upsets, inflammation of the lining of the gut and diarrhoea which will also interfere with nutrient absorption. Nitrate that is not either excreted or converted to urea in the liver, is turned into ammonia. 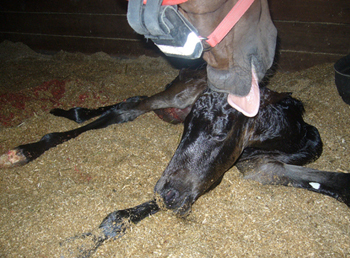 This is highly toxic and will cause abortions, still births and multiple problems in new-born foals as seen in Mare Reproductive Loss Syndrome in Kentucky, America back in 2001. Since nitrates accumulate in the lower parts of the plant and are utilised for plant growth, the more mature the grass, the less problems from this source. Vegetative grass is very high in potassium and low in sodium. Dr T. Swerczek, a veterinarian also in attendance during Mare Reproductive Loss Syndrome in Kentucky, 2001, has found that force-feeding sodium (meaning put it in their feed) in the form of sodium chloride (salt) and sodium bicarbonate will help balance this life and death ratio. 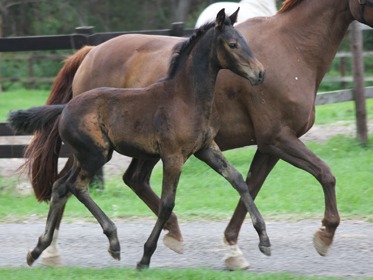 Thoroughbred studs following his advice have had their best foaling seasons ever with regard to the absence of abortions and limb deformities. High protein or high carbohydrate diets also lead to metabolic acidosis, meaning the blood and body fluids become acidic. Then precious alkaliing minerals like calcium and magnesium are used up in restoring correct pH. This is clearly counter-productive to optimum musculoskeletal development as calcium and magnesium are required in large amounts for laying down new bone. Both under-feeding and over-feeding can cause problems with the developing skeleton. Excessive carbohydrates such as in molassed grains will also contribute to acidosis, be detrimental to the hooves and tend to supply excess energy instead of nutrients for growth. Grains are not a good source of protein in general and are actually minerally imbalanced, being high in phosphorous compared to calcium. For healthy bone formation the ratio should be the other way around: twice as much calcium to phosphorous. Exercise stimulates bone growth and strength. Young horses require plenty of room to run around while growing. Protein and minerals are only part of the picture. Strong bones and good calcium absorption also require appropriate exercise. It is absolutely wonderful to be able to raise young horses in a large paddock where they have the freedom to run and play. However, it is a mistake to think that's all that is needed. The owner does need to understand exactly HOW the pasture can affect growth, health and indeed temperament of the horses they are breeding and to implement suitable pasture management strategies and feed appropriate supplements. Don't Short Salt by Dr T.W.Swerczek. DVM, PhD. 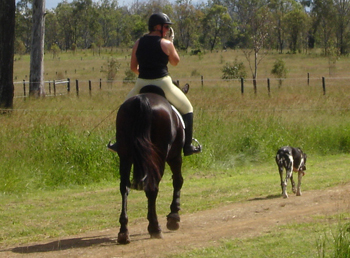 Pasture Postulating by Jennifer Taylor, Equine Sports Medicine Laboratory, Melbourne. Minerals "The Metabolic Miracle Workers" by Dr Robert Erdman and Meirion Jones. Dr Deb Bennett, PhD, of Equine Studies Institute. For further information, please contact Lucy Prior of Gotcha Equine.